My first day as a Debutante was September 1, 2014. My book launched on September 2, 2014. I was still working a fulltime job (for at least another couple of weeks). My publisher (Grand Central/Hachette) was in a dispute with Amazon so I had never had that golden PRE-ORDER button for my book. My husband was in the middle of his company being bought. We were having renovations done on the house. My parents were moving in with us. I sprained my ankle. So the time around my book launch will be lodged into my memory for a long, long time! Nothing really prepares you for being a debut author. I felt like I was better off than a lot of first-time novelists because I had a great network of published authors here where I live in the San Francisco Bay Area.Even if I hadn’t had all those other things going on in my life at the time, I still would have been overwhelmed. But even with all the advice and the planning, to say that it was an overwhelming time would be like saying a hurricane is a lovely afternoon breeze. You could, but you’d be crazy. In spite of all the craziness and the things I’d do differently if I knew then what I know now, my debut was a great time. Here are some highlights for me. My friends started sending me pictures of their cats and dogs with my book. This picture is of my brother’s dog Bear. 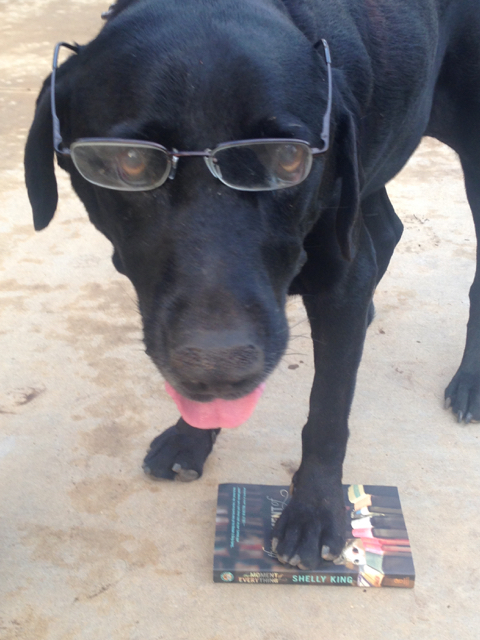 He’s an old pup so he has to wear his reading glasses. I loved seeing book bloggers talk about my book, even the ones who didn’t like it though nearly all of them did. It was amazing to me to think of my book out there with real people reading it and taking the time to write about it. It still floors me. A friend texted me that he was on BART and he saw someone reading my book. I’ve yet to see someone reading it in the wild, but I love that he did. I still get a kick out of seeing the delight on a bookseller’s face when I tell her I’m an author of one of her books, and I’d be happy to sign stock if she’d like. No one has ever said no. I love hearing how much people love the cover. A cat on the cover is pure gold, my friends. When I started getting emails from people telling me how my book made them cry or helped them through a difficult time or just meant something special to them, it really got to me. It still does. That never gets old. And I feel honored and humbled every time it happens. So paraphrase the great, late David Foster Wallace, being a debut author was a totally fun thing I’ll never do again. It was a great time. I’ll never forget it. It was my moment of everything. 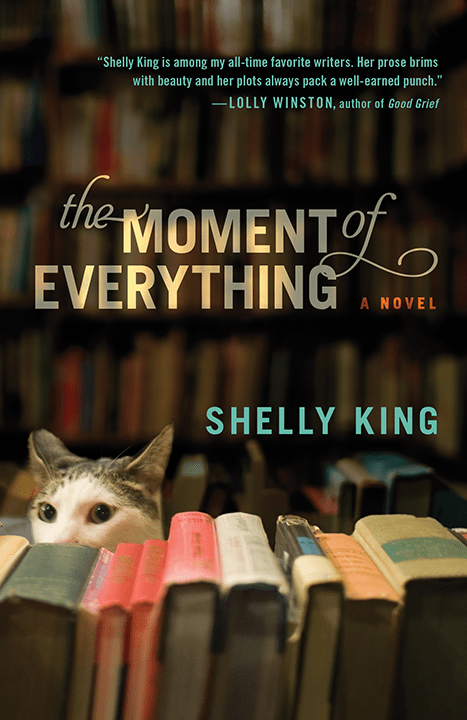 Shelly is the author of THE MOMENT OF EVERYTHING, story of love and books in Silicon Valley. She lives in the Santa Cruz Mountains with her husband, two big dogs, and a disapproving cat.